Jenny Kane - jkane@shawmedia.com Prairie Ridge senior tight end and punter Nick Margiotta, holds up his IHSA Class 6A football state title ring after receiving it Wednesday during an assembly at the high school in Crystal Lake. 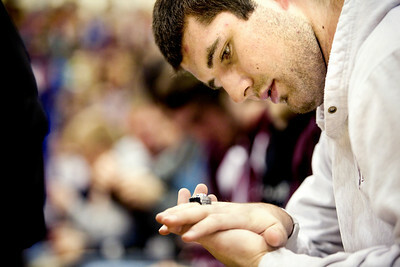 Jenny Kane - jkane@shawmedia.com Wed. Feb. 22, 2012, Prairie Ridge senior tight end and punter Nick Margiotta, looks at his IHSA Class 6A football state title ring after receiving it Wednesday during an assembly at the high school in Crystal Lake. Jenny Kane - jkane@shawmedia.com Wed. Feb. 22, 2012, Prairie Ridge students Haven Comeaus, junior, (right), Evan Czonstka, senior, (center) and Kevin Porter, senior, (left) look at a game Czonstka is playing during an all school assembly held at the high school in Crystal Lake. 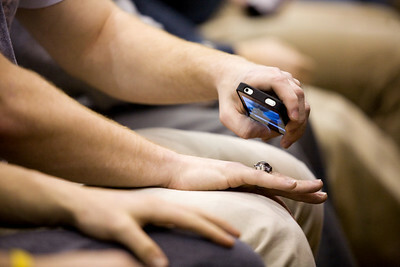 Jenny Kane - jkane@shawmedia.com Wed. Feb. 22, 2012, Prairie Ridge defensive tackle, Steven Bashor, takes a photo of his IHSA Class 6A football state title ring after receiving it Wednesday during an assembly at the high school in Crystal Lake. Jenny Kane - jkane@shawmedia.com Wed. Feb. 22, 2012, Prairie Ridge senior Jake Walker, (left) compares his class ring to his the IHSA Class 6A football state title ring to junior Michael VanBosch, (right) after receiving it Wednesday during an assembly at the high school in Crystal Lake. 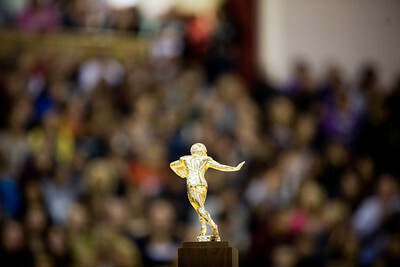 Jenny Kane - jkane@shawmedia.com Wed. Feb. 22, 2012, The IHSA Class 6A football state title trophy stands in the center of the Prairie Ridge auditorium during an assembly at the high school in Crystal Lake to honor their athletes and the students selected to the All-State choir. 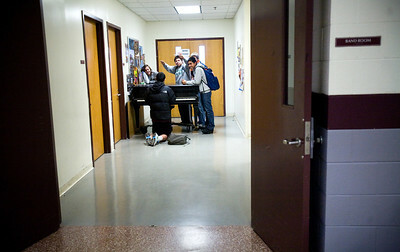 Jenny Kane - jkane@shawmedia.com Wed. Feb. 22, 2012, Prairie Ridge students gather in the band room hallway and play the piano while other students and faculty usher into the gymnasium for an assembly at the high school in Crystal Lake to honor their athletes and the students selected to the All-State choir. Jenny Kane - jkane@shawmedia.com Wed. Feb. 22, 2012, Prairie Ridge junior Dan Williams and sophomore Rhi Kornak listen to music while an assembly all school assembly is held at the high school in Crystal Lake to honor their athletes and the students selected to the All-State choir. Jenny Kane - jkane@shawmedia.com Wed. Feb. 22, 2012, Prairie Ridge football player junior Jake Touchy looks a the trophy the team received after being named one of the top 50 teams in the nation by the Max PREPS website during a assembly. Jenny Kane - jkane@shawmedia.com Wed. Feb. 22, 2012, Prairie Ridge coach Chris Schremp picks up the IHSA Class 6A football state title trophy after an assembly at the high school in Crystal Lake. Jenny Kane - jkane@shawmedia.com Wed. Feb. 22, 2012, Prairie Ridge senior tight end and punter Nick Margiotta kisses his girlfriend, Noelle Trobiani, junior, after an assembly at the high school in Crystal Lake to honor their athletes and the students selected to the All-State choir. 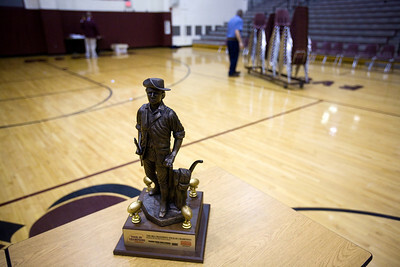 Jenny Kane - jkane@shawmedia.com Wed. Feb. 22, 2012, A trophy the Prairie Ridge football team received after being named one of the top 50 teams in the nation by the Max PREPS website stands in the center of the Prairie Ridge auditorium after an assembly at the high school in Crystal Lake. 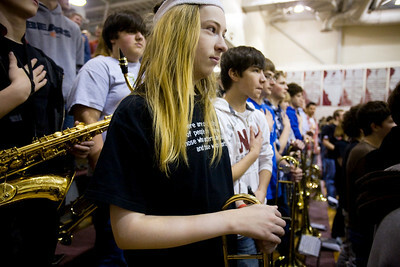 Jenny Kane - jkane@shawmedia.com Wed. Feb. 22, 2012, Prairie Ridge freshman Nigel Ticknor, (center) stands for the playing of the national anthem during an assembly at the high school in Crystal Lake to honor their athletes and the students selected to the All-State choir. 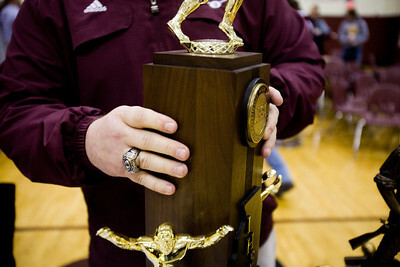 Wed. Feb. 22, 2012, Prairie Ridge coach Chris Schremp picks up the IHSA Class 6A football state title trophy after an assembly at the high school in Crystal Lake.